In the continuing effort to help the automobile and broadcast industries deliver an enhanced user experience and increase safety in vehicles, Radioplayer introduced at the WorldDAB General Assembly in Berlin the Reference Radio, a prototype touchscreen radio for dashboards. The Reference Radio “hybrid” prototype is multiplatform, able to play DAB digital radio, FM, and internet radio streams, and shows a single list of stations across all those platforms. 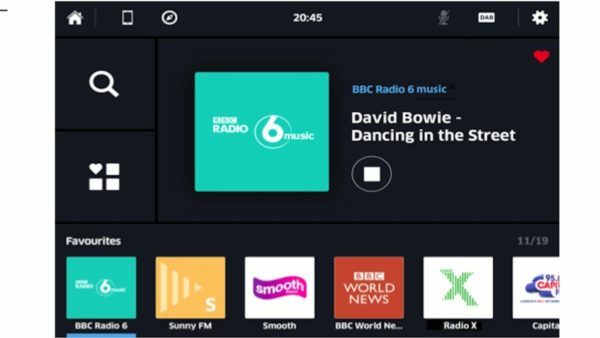 This means drivers don’t need to select different sources such as DAB, FM, or internet, but only tap a station logo to play it, leaving the system to handle the rest. According to the company, safety has been a key factor in the design, reducing “driver distraction” with an easy, intuitive interface. A large display shows what’s playing, and the driver switches between favorite stations by tapping a logo, swiping the screen, or pressing the buttons on the steering wheel. In the next phase of development, Radioplayer plans to test voice control along with podcasts and personalization. A video demonstration of the Reference Radio in action can be seen here. Looks interesting. No AM as that portion of the spectrum is essentially dead in Europe. I wonder if HD feeds are catching on here in Canada? I still switch frequently through AM, FM, and XM.